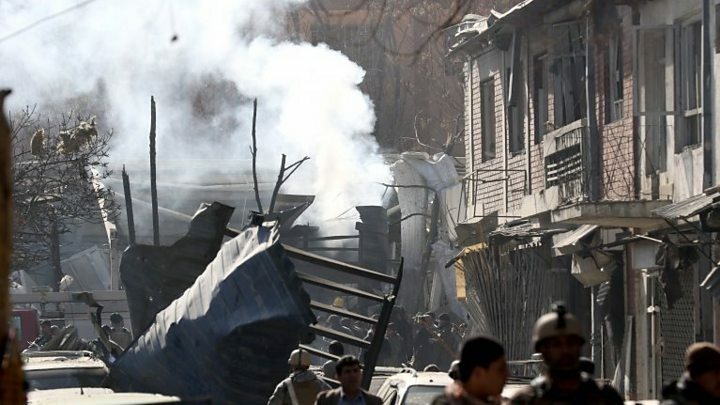 A suicide bombing has killed at least 95 people and injured 158 others in the centre of Afghanistan's capital, Kabul, officials say. US President Donald Trump called for "decisive action" against the group after the "despicable" bombing. The BBC's Zia Shahreyar, speaking from the scene, says it is not easy to get through the checkpoints. Cars are searched and drivers' identities checked. MP Mirwais Yasini told the BBC the area looked like a butcher's shop afterwards. Another witness, a software engineer who wished to remain anonymous, told the BBC he was about a kilometre (two thirds of a mile) away when he heard the noise. "I condemn the despicable car bombing attack in Kabul today that has left scores of innocent civilians dead and hundreds injured. This murderous attack renews our resolve and that of our Afghan partners."